Anticipation is become an endangered emotion. The immediateness of society has numbed us and made us believe that waiting is an unnecessary part of life. Thankfully biology has kept us in touch with the reality of anticipation. There was a time when you waited until spring for strawberries, when you ate tomatoes in summer, when winter squash came in the winter. Eating seasonal is so fashionable any discussion of the behavior is a bit banal. Pregnancy is great reminder about the power of anticipation. Forty weeks of waiting. And for most of human experience, women waited and waited in the hope that their wombs were holding a son (hopefully some were happy with a girl.) Science has helped us with the gender thing. But, we still have to wait the long wait. But modern life bucks this trend. Instead of prizing anticipation and enjoying the time we wait, we think of time as a commodity. Most magazines are advertising ways to help you save time. But, what are we doing that is worthwhile with that time? Here is where anticipation and waiting come in. If you save up all that time only to be busy doing more things, what’s the point? Enjoying the moment is quite another thing altogether. The momentary has often been lost on me. But, with Belle, I am learning. Learning to appreciate the wait is a skill that I am trying to teach my Belle. When your whole life is half a Presidential term, it is hard to appreciate long stretches of time. But, in trying to help her realize why waiting is worthy, say like waiting for the cupcakes to bake, I am learning to appreciate the time we wait together. For that reason, when we had J—‘s family over for brunch, I made some easy, fast recipes. But, then I didn’t take too many food pictures, I didn’t write a post right away, I did care about keeping the moment for the future. I just lived the moment. And, now I anticipate another such morning. With the hecticness of life, another such morning won’t happen for a long time no doubt. But, we can enjoy the wait. Grate potatoes, toss with salt, pepper and olive oil and then pack into the bottom and on the sides of a deep dish pie pan. The potatoes will shrink so over fill it. Bake at 375 until brown. Place in the freezer over night. The next morning, whip 2 egg whites. ¼ cup diced steamed asparagus. Pour into frozen crust. Top with a few spears of steamed asparagus. That's so fluffy and good! True. We went blueberry picking yesterday, and afterwords stopped at that behemoth of stores (C-co) to pick up some salad. There in the isle was a mountain of blueberries, for less work and less money, and my first shameful thought was "why did we do this?" and then I imediately squashed that thought with memories of laughing on my husband's shoulders as I stretched to reach for a cherry that was just a bit too high. What a great menu, everything sounds yummy. lovely post! I certainly think that anticipation makes everything a little more exciting and meaningful, whether it's waiting for a slow-cooked dish to be ready, planning activities for an upcoming vacation, waiting for a baby to be born (not me yet though :)! ), or a whole host of other things. Thanks for the little reminder! And the pie looks absolutely delicious! Nice pie and you certainly have more patience than me. Fresh ingredients, simple recipe = delicious outcome! Okay .. 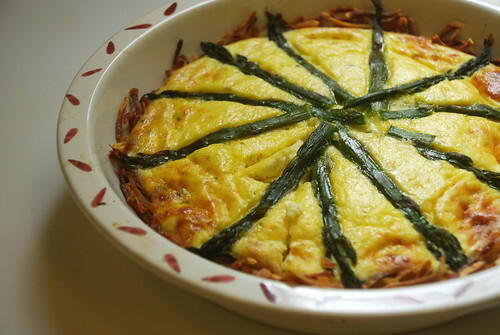 I am definitely doing this asparagus egg pie this Sunday, because I pick up my farm fresh eggs on Saturday. I have been waiting (very patiently, what else have you got but time when you are retired like me?) for news of the new little one soon to join your household. This looks delicious with taters and asparagus! Worth the wait, for sure! Great point. It's so easy to get caught in the speed of life these days. Nice to remind oneself that some things are worth waiting for. This looks so delicious and satisfying! As I recall, the author said which food processor did the job best but then went on to say something along the lines of "But what are we saving the time for? I happen to like cutting up onions by hand. I like that my eyes burn a little and tear up. I like the non-uniform slices. It's all part of the final dish." This also reminds me of all the times that my dad chastised us for saying "I can't wait until....". He always reminded us to remember to notice what was happening in the moment rather than wishing the moment away. Happy waiting!! And well done on your local eating program. wonderful creation.. can't believe u are still taking pictures & blogging:-) good luck! Anticipation -- I have a love hate relationship with it because I'm so impatient :)! 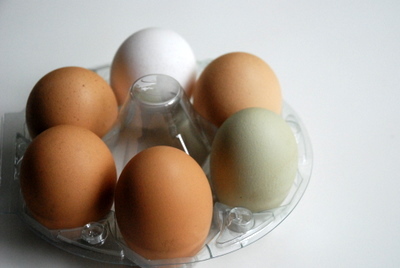 Eggs are a superfood for expecting moms! This looks lovely and so nutritious. love riccota and been looking for a recipe. thanks! Looks beautiful! I am saving the recipe for sure.